A perfect road trip always starts with a dream to see the world around you and it brings in much more learning than any book can ever if you can pay the price of it. My Perfect road trip started with a dream to drive SUV for more than 2000kms. I had always driven for not more than 500 – 800 kms on an extended weekend trip in my small car. Driving an SUV gives you a comfortable ride and the power the SUV has always attracted me towards it. Somehow I started for a drive in TATA Safari for a friend’s marriage in Allahabad in the evening and planned to stayed at another friend’s in laws in Mathura who was travelling with us with family. From there early morning to reach Allahabad was the idea but I had to came back as my 4 months old daughter suffered from fever and I had to take the first bus back to Gurgaon. My dream to drive/travel long distance in a SUV crashed. A new hope got initiated that this time, I will drive the SUV and will travel long distance. Cutting long story short, I went to London for my company project and there came April long weekend having Fri, Sat, Sun, Mon. It was enough to travel across UK to see Scotland and Lake District. I asked my friends and 3 of them said yes immediately. We started planning for the trip as this was my first driving experience in UK. We thought of various options to travel to various destinations and then charting out the routes for the same. Finally the plan was laid with all of us 4 friends agreeing to the route and we started checking the costs involved. Started with renting a car online checking the best of the cars and finally settling for an automatic one, but I never knew what lies in store for me. Finally, we asked for another friend to join in as the costs were high for 4 people and having an extra member will cost the travelling cost. Me and one of my friend Abhishek was the main people to plan the hotels, routes and plan to stay at particular city for what time. So finally after doing everything right, we waited for the Thursday to end and reach out respective homes asap. I had to go early in the afternoon to pickup the car from Enterprise-a-Car from the station we booked at. We reached the location using the London Tubes and reached the car rental agency soon. 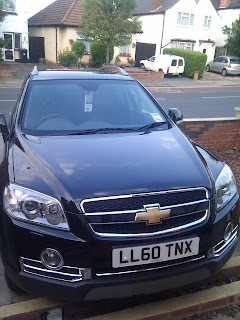 The company guy asked where we wanted to go and considering out trip to the top most part of UK, gave us the Chevrolet Captiva. Wow! I was so happy to see the SUV and he continued to tell the features of the car. It was an automatic car with GPS fitted in the car itself. After paying them the price of the car for rent, we drove the car to my home. Meanwhile, I found it difficult to locate the car’s diesel tank opening button and kept us waiting at the petrol pump. Finally, the car was standing tall outside my house. Driving an automatic for the first time took me some time and extra brakes while driving home. Finally time to sleep and take some rest and packing the clothes before the start of the trip. As per the planned time, I woke up at 130 am in the night and went for bath. Finally left my home at around 210 am to reach my friend’s home at 230 am. Morning freshness was still there in the environment and I totally missed the AmbiPur car fragrance on my beautiful journey. We all packed with all the luggage in the boot, fruits and snacks to eat was all packed up. Around 3 am we were hitting the road from London to Lake District (300 Miles). It was a journey of around 5 hours to reach one end of Lake District and we had our share of joys in the way with having breakfast at the leisure points that comes on the highways after every 50-100 miles. Finally we reached the beautiful lakes and loves every part of roaming around as the boats will open at around 1030 am. We were the very first people to reach the lake. After looking around and taking a boat ride to the other end of the lake district, my friends has a surprise for me. It was their home cooked Aloo-Poori for all of us with Achaar. I really loved the brunch we had at the spot sitting near the lake on a wooden bench. Finally having an ice cream after lunch was the best dessert as we started our next journey to reach Portree, Isle of Skye (350 Miles). The GPS was helping us find a way through UK. On our way, we passed through the city of Glasgow and the biggest lake of UK, Lake Lomond. We see a lot of CARAVANs with people setting up their tents near Lake Lomond. Scottish people call Lake as Loch. Enroute way, we fall in love with Scotland as shown in P.S. I love you movie and the various types of mountains that were there in our route. It was dinner time and we found out another Indian restaurant in Fort Williams when we reached there at 800 pm. As it was our appraisal time, my increased salary letter as I had dinner and checked the same online. It made me happy and took away all the tiredness. The journey towards the Portree started soon after the dinner. The GPS was leading the way through the dark forests with hills on one side and sea/lakes/valleys on the other. It was a really drive which I thought existed in Ramsay brothers serials where suddenly a lady in white will come on the road. I kept pressing the accelerator hard and we soon reached the city of Mallaig around 1030pm. We wanted to reach Portree but reached Mallaig only to see that we havn’t unclicked the ferry option. It was a ferry that takes you across Malaig to Portree on a 30 min boat ride with car. They had already closed their ferry boat rides at 630pm. I asked my friends that it’s a one hour more ride as we need to go once again on the road to Fort Williams and one town before need to take another motorable road. We checked out a bar/motel for lodging and cancelled our hotel rooms in Portree as it was not possible to reach after we had such Ramsay experience on the road. My first day I started driving at 3am till 1130pm in the night with 1100 km on the SUV trip meter. It was a dream fulfilled on the very first day itself and other days were added bonus. We slept well in our rooms before again starting our journey to Ben Navis Range and Inverness. The next day brought some amazing places and amazing routes as were off our plan to Portree. We never thought that it will be a blessing in disguise. We reached Ben Navis range and took cable car to reach the top of the moutains. We saw people mountain biking, trekking enroute. It was so cold up above the top of the mountain and the air was flowing so fast that it made difficult to stay at the top for long. We started our journey to reach Inverness which was not more than 100 miles for the whole day. We roamed around the lakes and the cities to reach Inverness in the evening at 4 pm. We came to a halt to eat Domino’s pizza in a car parking and kept our car there to see Inverness on foot. We have our hotel booked in Inverness. We checked into the B&B we had booked for ourselves and saw the city on foot. We went on to see the Inverness airport and did some shopping at the nearest TESCO superstore. Finally, it was the day where we enjoyed the beauty of a hill station and the sea together. While travelling around Inverness, a police cab followed me and asked me to make a halt towards the side of the road. They came out of their car and asked me to come out too. They asked where are we coming from and told me my mistake. As there was no one on the road, I was driving in the middle and as someone from other side used to come, i took my vehicle towards the side. This made the policeman angry over me and told me with a warning to drive carefully and he will keep an eye on me. The next day was the time when we had to see the UK highlands. We left our B&B after having an English breakfast. We had no plans to reach anywhere that day as the full day was planned for highlands. We went to see a castle in highlands on random and it turned out to be a nice trip. After seeing the castle, we travelled to Edinburgh (231 Miles) via Aberdeen. In a town near Aberdeen, we found a simply amazing sea beach. We had plans to see the Edinburgh, under sea world the same day, so had to reach there before 530pm but GPS played spoilt sport as somehow two postcodes were entered in GPS. It made us cross the Forth Bridge thrice as we watched the beauty before being rejected entrance at Undersea world. It was time to checkout the beautiful city of Edinburgh. We saw the beautiful city before reaching our dormitory as we couldn’t get any B&B due to holiday rush. The only problem with dormitory was the unavailability to recharge our cameras and mobiles. We went out and eat at somewhat called the Tapas food joint which was costly as they gave the food in small katoris for a single person. We really loved seeing the city and finally sleeping on the dormitory room. Next day we had to see the Edinburgh Castle and Underwater Sea World before finally saying goodbye to Scotland. It was a long travel back to London as we started around 3pm after having lunch at McDonald’s in Edinburgh. London was around 400 miles via Newcastle. I drove all the way before reaching home at around 930 pm and finally dropping my friend reached my house at around 1030pm. It was a great trip and I thoroughly enjoyed with all my friends and made some best ones out of them. A dream got fulfilled and I am so happy! Thanks all!